This project has been put off long enough. The snow is melted and temperature in the 50s. The first NOS QT we bought went into Phoebe today! The QT came without speedometer gear, Edrive switch and vent cap on the inspection plate. I opened the inspection plate and poured a little QT fluid on the shifter parts. The yokes were removed and seals inspected. They were very pliable, so I figured just go with it. Spread a little grease on the seals before yokes installed and torqued. The speedometer gear from Phoebe's original QT was worn and did not fit the inner cable very snug. Another was recovered from a donor for use and cleaned up. I used the gasket from the seal kit to trace the pattern on some Napa 1/32" gasket material and cut it out. This seals better than what comes with the kit. I imagine you could use 2 gaskets stacked but I feel better cutting a new one with the thicker paper. A little grease was also pread on the double seal to the transmission output shaft. Then a thin layer of blue silicone was spread on the back of the transmission to QT adapter and put the paper on it. Another thin layer of silicone used on the other side of the paper. The two bolts for the drivers side were run through the from back side of the adapter to provide dowel pins to line the QT up when it was installed. The QT slipped in very easy. The vacuum lines were connected to the shifter diaphragm and attached to the case. 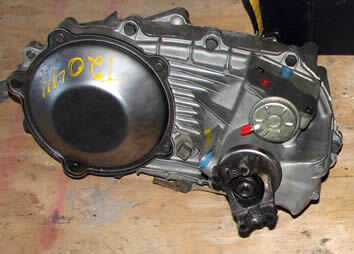 The transmission shaft collar for the high range only was removed. A thin layer of silicone was spread on the seal. The cleaned and inspected low range unit was attached. Next was attach the Edrive indicator wire to the switch and connect the speedometer cable. Then I attached the low range shift linkage. Getting ready to rock and roll!